I’ve showcased a few vintage ads that were popular back over a half century ago which many younger people have never seen. This can give you a little idea of the times back then. Except for the U.S. Savings Bonds ad it is most unlikely even the same companies exist, let alone run similar ads. 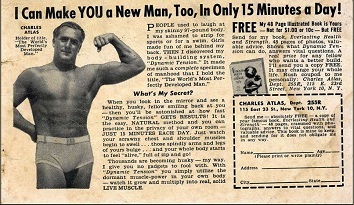 Charles Atlas Ad from 1952. 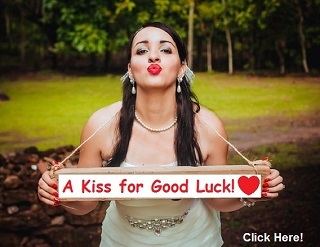 Click image to see actual ad. Charles Atlas, born Angelo Siciliano (October 30, 1892 – December 23, 1972), was the developer of a bodybuilding method and its associated exercise program that was best known for a landmark advertising campaign featuring Atlas’s name and likeness; it has been described as one of the longest-lasting and most memorable ad campaigns of all time. According to Atlas, he trained himself to develop his body from that of a “scrawny weakling”, eventually becoming the most popular muscleman of his day. He took the name “Charles Atlas” after a friend told him he resembled the statue of Atlas on top of a hotel in Coney Island and legally changed his name in 1922. His company, Charles Atlas Ltd., was founded in 1929 and, as of 2010, continued to market a fitness program for the “97-pound weakling.” The company is now owned by Jeffrey C. Hogue.